Break The Silence 4 YEAR ANNIVERSARY! Our four year anniversary is coming up and we want you to be a part of it! Meet old face and new as we reminisce on memories and look forward to building new ones. First timers highly encouraged! 7-10PM, sign-ups begin at 6:30PM. Please arrive early to guarantee slot. 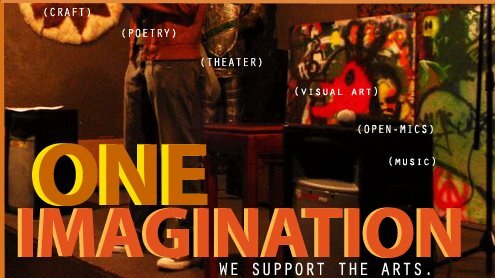 Email ONEIMAGINATION@GMAIL.COM for more information. Featured in this video is Sumiko Braun, a hip hop/spoken word artist involved with The CollectiV and One Imagination. Because it only "gets better" when we do something about it. 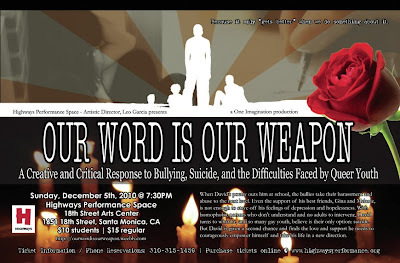 When David's poetry outs him at school, the bullies take their harassment and abuse to the next level. Even the support of his best friends, Gina and Melanie, is not enough to stave off his feelings of depression and hopelessness. With homophobic parents who don't understand and no adults to intervene, David turns to what he, and so many gay youth, believe is their only option: suicide. But David is given a second chance and finds the love and support he needs to courageously empower himself and take his life in a new direction. If you care about the lives of youth, if you want to understand the struggles youth face, if you want to change the way things are, then you don't want to miss this show.